I was so excited to finally Periscope from the @SLPBloggerLive handle yesterday! I shared a video version of my “10 Ways to Play” posts for spring. If you haven’t signed up for Periscope, you can do that here using your twitter handle. It’s a live streaming app where you can interact with a person who is scoping live! Keep in mind, it’s LIVE so there will be mistakes, but that is part of the fun! 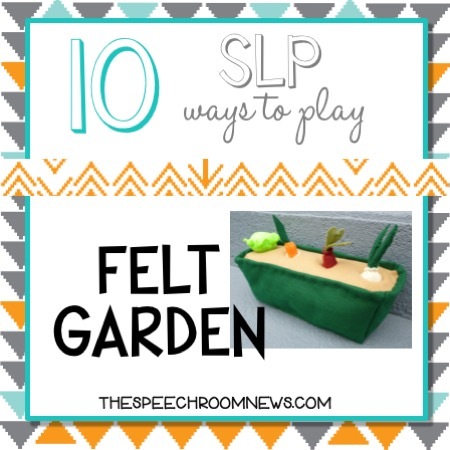 Here are my 10 ways to play with a felt garden! You can find several different felt gardens on Etsy in the search here. Here is a quick recap of the ten ideas I highlighted. 2.Prepositions (above/below) pair that with the book Top and Bottoms. 3.Pretend Play: Using stuffed animals to move beyond procedural play. 5.Vocabulary and Core Words for AAC devices. 8.Expanding play to a marketplace with money for older students. I also love to use apps to build language and I jumped over to the @speechroomnews periscope channel and shared my very favorite app for garden themes, Dr. Panda’s Veggie Garden ($2.99). It’s seriously fun and stuffed full of language!!! Keep playing!!! Don’t forget to follow both @SpeechRoomNews and @SLPBloggerLive on Periscope so you don’t miss all the information! I have absolutely LOVED watching all your videos and the ones at @slpbloggerlive on Katch.me. I am never able to catch them in real time on periscope, so this has been FANTASTIC. I was so upset when I saw that Katch will be closing down May 4th :(. Do you all have any plans to move the archives/replays to Youtube or another place? Thank you so much for all the amazing ideas and therapy tips!